…and so on. However, there’s one factor that can tilt the scales in your favor over time. I know because I’ve seen it time and again with different school owners in my coaching programs. You can have two school owners who have the same skills and experience level, and the same general knowledge of how to start and run a dojo, and one will do much better than the other. Implementation. It’s a simple as that. The school owner who implements what they learn about how to run a successful dojo will outpace the school owner who learns new things and then sits on their hands, every single time. However, you can’t just implement ideas willy-nilly and expect great results. 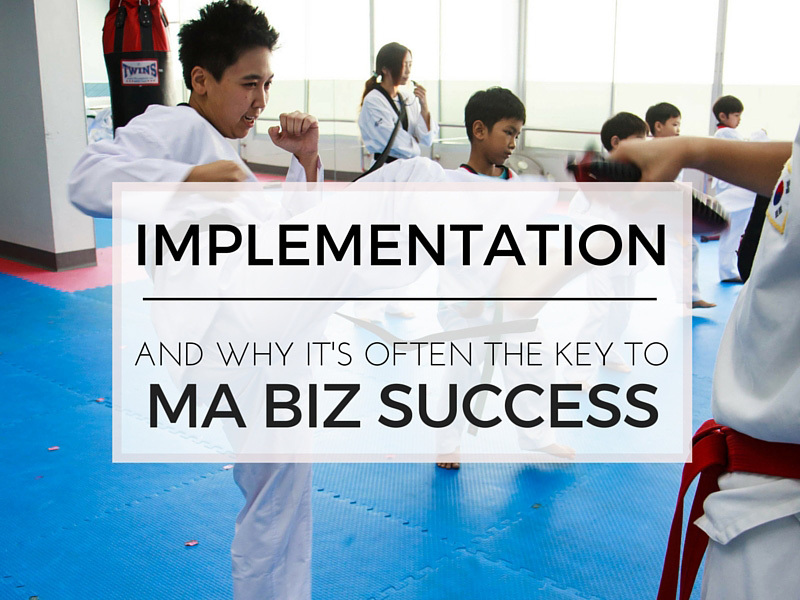 implementation is the key to success in starting and running a martial art school. Those who implement, succeed. But how can you 10x those results, and speed up the process of starting and growing a successful dojo? And, how can you avoid implementing ideas that aren’t right for your school? Let me explain what I mean, starting with useless information. Recently in my newsletter, I talked about the “merchants of B.S.” These are people who are great at selling you on useless and superfluous ideas and information. A lot of it they just pull out of thin air (my dad would say they pull it out of their rear), because when you’re selling people information, and you don’t know what the heck you’re talking about, you make things up. You may think I’m kidding, or exaggerating. I’m not. I know this because I spent a lot of my own money separating the B.S. from the good stuff when I first started out in this industry. So, a big part of your success — and the SPEED of your success — will hinge on avoiding information that doesn’t work or that you don’t need. And, there’s a lot of it out there. A LOT. I have school owners come to me all the time who are frankly quite jaded and skeptical, because the merchants of B.S. got to them before I did. Seriously, that’s pretty much the gist of a lot of the emails I get. Now, what does that tell you about our industry? It tells me a lot. One, that there are people out there presenting themselves as subject matter experts, who aren’t. Two, that there’s a lot of information floating around in the industry about how to run a successful school that is either superfluous or just plain wrong. And three, that a lot of you are falling prey to bad info and dishonest people. Maybe you’re stuck at 30 students, or 50 students, or 80 students. Maybe you think this is as far as it goes for you. Maybe you stopped believing you could earn a decent living at this. And if that’s the case, maybe it’s time you got help. I’ve personally coached dozens of school owners through the process of launching and growing a successful martial art school, the Small Dojo Big Profits way through one-on-one coaching… and I can show you, too. The best part is that now it won’t cost you an arm and a leg to get coached by me. Now, I’m not going to tell you that you’re going to get one-on-one coaching with me in that group. The operational word here is “group,” meaning I work with the entire group together. That’s why it’s so affordable. However, you will have the opportunity to have your specific questions answered, and you will get a ton of encouragement and support from myself and from the group. Most importantly, you’ll discover the proper steps in the right sequence to grow your school to the next level. Also, I will shoot you straight. To be honest, that’s why some people don’t stay in the group. It’s rare, but it happens. It’s because I don’t candy coat things, I don’t spoon feed people, and I don’t just tell people what they want to hear to keep them around. Instead, I’ll tell you what you need to know to succeed. Big difference. Go to http://martialartsbusinessu.com right now to learn more.